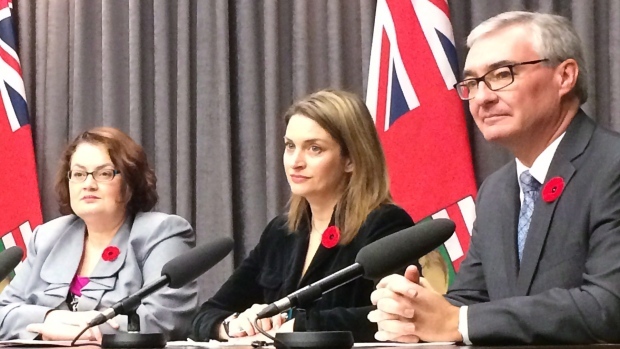 WINNIPEG -- A former Manitoba cabinet minister who challenged Premier Greg Selinger's leadership announced Wednesday she is leaving politics -- a move that one analyst says is a blow to the NDP government's chances in the April 19 election. Jennifer Howard was nominated for the NDP in her Fort Rouge constituency last May, but bowed out Wednesday, partly due to a desire to spend more time with her two young children. Her youngest was born last year. "I've watched lots of my colleagues raise their kids while in office, and I respect them for that ... but I also know there's a tremendous sacrifice," Howard said. "If you're going to make that sacrifice, you have to be completely convinced that it's the right thing to do, and I am not." Howard has been offered a new job in Ottawa. She wouldn't reveal details, other than to say it offers her a chance "to continue to work for equality and social justice." She was a key player in the NDP cabinet, holding portfolios such a family services, labour and finance. She was also the party's house leader during a standoff with the Opposition Progressive Conservatives in 2013 that saw the Tories delay bills to protest a tax hike. Howard and four of her cabinet colleagues broke ranks in the fall of 2014 and publicly called on Selinger to resign amid slumping poll numbers. He refused to step down and the party held a leadership contest that Selinger survived by a 33-vote margin. She is the fourth of the so-called rebels to leave politics. Only one -- former justice minister Andrew Swan -- is running for re-election. Reuniting the party is an ongoing effort, Howard said. "There's tremendous progress being made on that front. I won't say that that work is done." Howard's departure is bound to make life easier for the Manitoba Liberal Party, which currently has only one legislature seat, said political analyst Royce Koop. The Liberals have surged in opinion polls and Leader Rana Bokhari is seeking her first legislature seat in the constituency held by Howard. Bokhari will still face an uphill battle in a long-time NDP area, Koop said, but now has an easier path. "She's not running against an incumbent MLA, a former cabinet minister, someone with a high profile," Koop said. Opinion polls since 2013, when the government raised the provincial sales tax, have suggested the NDP is well behind the Tories and battling for second-place with the Liberals. A Mainstreet Research poll, released Wednesday and commissioned by Postmedia, suggested the Tories had 52 per cent of support among decided or leaning voters. The poll pegged support for both the NDP and Liberals at 20 per cent. One in four respondents were undecided. The telephone survey of 1,628 Manitobans was conducted on Jan. 25 and is considered accurate within +/- 2.43 per cent, 19 times out of 20.